"If you've always wanted to learn more about song writing and the structure of music, but don't know where to start, this free online book is filled to the brim with pages that make understanding music theory easy." according to Lifehacker. 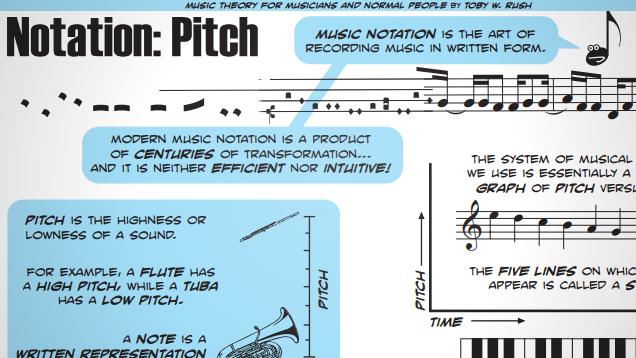 Toby W. Rush's "Music Theory for Musicians and Normal People" covers a massive range of topics like pitch, rhythm, scales, intervals, and harmonics. The online book itself is more arranged as a collection of high-quality PDFs that offer diagrams, notes, and tips for everything music theory related. There's around 50 PDFs to go over, but each one could make for a useful reference printout if there was a specific topic you're interested in. Learning to play music can have a number of benefits, and though music theory isn't required for doing so, it can certainly help if you want to create your own tunes.